Rohnfried Energie Oil 250 ml, (blend of 7 natural oils for rich, high-energy). Home > birds>Products for pigeons>Tea and infusions for pigeons>Rohnfried Energie Oil 250 ml, (blend of 7 natural oils for rich, high-energy). - Increases the body's energy reserves. - Season flights: 1-2 times a week; mix 5 ml of product per kg of food. - Playback: 3 times a week; mix 5 ml of product per kg of food. Product Name:Rohnfried Energie Oil 250 ml, (blend of 7 natural oils for rich, high-energy). Description: Rohnfried Energie Oil is a blend of 7 natural oils enriched with lecithin, the source of energy 100% natural for pigeons racing. 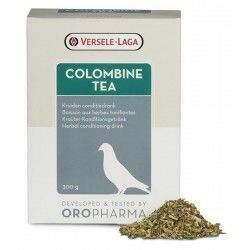 Path: Home > birds > Products for pigeons > Tea and infusions for pigeons > Rohnfried Energie Oil 250 ml, (blend of 7 natural oils for rich, high-energy).